The Mountains to Sound Greenway encompasses part of the historic route of the Chicago, Milwaukee, St. Paul and Pacific Railroad (the Milwaukee Road) over Snoqualmie Pass. It is important to know about the history of the Milwaukee Road to fully appreciate the Greenway. The Milwaukee Road began in 1847, as a local carrier operating between Milwaukee and Wisconsin. By 1874, it had lines running through Wisconsin, Minnesota, Iowa, South Dakota, and the Upper Peninsula of Michigan. The “Pacific Extension” of the Milwaukee Road was financed by Rockefeller money. In 1900, William Rockefeller, brother of John D. Rockefeller, obtained control of the Anaconda Copper Company, with its copper mine and smelter near Butte, Montana. Rockefeller wanted to build a third railroad from the Midwest to Puget Sound to gain access to the growing Asia trade and to the riches in between. The Milwaukee Road was the third railroad connecting the Midwest with the Northwest, following the Northern Pacific (completed in 1884, going over Stampede Pass to Tacoma) and the Great Northern (completed in 1893, going over Stevens Pass into Seattle). Union Pacific completed its Oregon Short Line from its main line in Wyoming, through Idaho to Portland in 1884, with a route connecting to Seattle. In 1901, a survey estimated the Milwaukee Road’s Pacific Extension would cost $45 million, later increased to $60 million. The route was expensive because of high right-of-way and construction costs. Unlike the Union Pacific and Northern Pacific, the Milwaukee Road was not given government land grants or other subsidies, and had to purchase land from private landowners, and take over small, new, or floundering railroads across the region. The 2,300 mile route was 18 miles shorter than its competitors, but it bypassed major population centers, passed through areas with limited local traffic potential, its tracks paralleled the Northern Pacific tracks, and went through some of the nations’ most varied and difficult topography. It crossed five mountain ranges: the Belts, Rockies, Bitterroots, Saddles, and Cascades, which required major civil engineering works and the use of additional locomotive power. Rockefeller obtained a right-of-way for his line before the national forests in Montana and Idaho were designated by President Theodore Roosevelt and Gifford Pinchot. The new line, which took thousands of workers to complete, had “to bore straight into the wild heart of the Roosevelt reserves,” including the rugged Bitterroot Mountains in northern Idaho. No railroad ever spent as much, $75,000 per mile to lay track through the Rockies. The toughest section was the 22 miles through the Bitterroots which required the construction of 21 bridges, 16 tunnels, and seven high trestles to span major chasms. “But flush with Rockefeller money, the Milwaukee Road had the cash, and so the once empty reaches of the Bitterroots clogged with people rushing to make money off the latest boom in the West.” The route through the Bitterroots accessed millions of board feet of old growth timber, providing future revenue for the railroad. Surveying in Washington began in October 1905, with crews laying out three possible routes. The crews surveyed 1,655 miles, even though it was only 300 miles from the Idaho border to Maple Valley, where the Milwaukee Road would connect with the Columbia & Puget Sound Railway to reach downtown Seattle. Crews surveyed 5.5 miles of right-of-way for every mile chosen for the main line. Robert Strahorn, a railroad promoter and developer, convinced the Milwaukee Road to build its line though Spokane rather than south of the city, to take advantage of the Union Station he built to service all railroads running through town. H. C. Henry won the $20 million contract to construct the line through the Cascades over Snoqualmie Pass. Construction in Washington began in May 1906. The last rail was laid on March 29, 1909, just in time to carry passengers to the Alaska-Yukon-Pacific Exposition in Seattle. Passenger service began on June 10, 1909, and the first freight train from Chicago to Seattle ran on June 25, 1909. Several years of work remained to finish the line, including construction of the Snoqualmie Pass Tunnel. The Milwaukee Road’s tracks went through the Bitterroot Mountains, which was devastated by the huge forest fire of 1910, that burned vast areas of Idaho and the West, described by Timothy Egan in his book, Big Burn: Teddy Roosevelt and the Fire that Saved America. At least a dozen Milwaukee Road bridges in the Bitterroots burned, including one that was 725 feet long. Between 1912 and 1914, the Milwaukee Road constructed a 2.3 mile tunnel under Snoqualmie Pass. The surface right of way over the Pass was abandoned after the tunnel was put into use. In 1915, a two-lane road over Snoqualmie Pass was built near the old Milwaukee road’s surface route, called the Sunset Highway, creating a permanent transportation corridor connecting eastern and western Washington. In 1917, the Milwaukee Road was electrified through the Bitterroots, giving the company the longest electrified mainline in the world. Transcontinental train lines made possible a huge population growth in the Northwest in the first decades of the twentieth century. “Suddenly, as if an immigration starting gun had gone off, people poured into Montana, Idaho, and Washington – a growth spurt like no other in the history of the Northwest…[N]o states grew faster during this spurt than Idaho and Washington. Their populations doubled in less than a decade. Idaho went from 162,000 to 325,000, and… Seattle tripled – from 80,000 to 240,000. Milwaukee Road train snow plow, clearing tracks toward the Milwaukee Ski Bowl. Photo Walter Page. 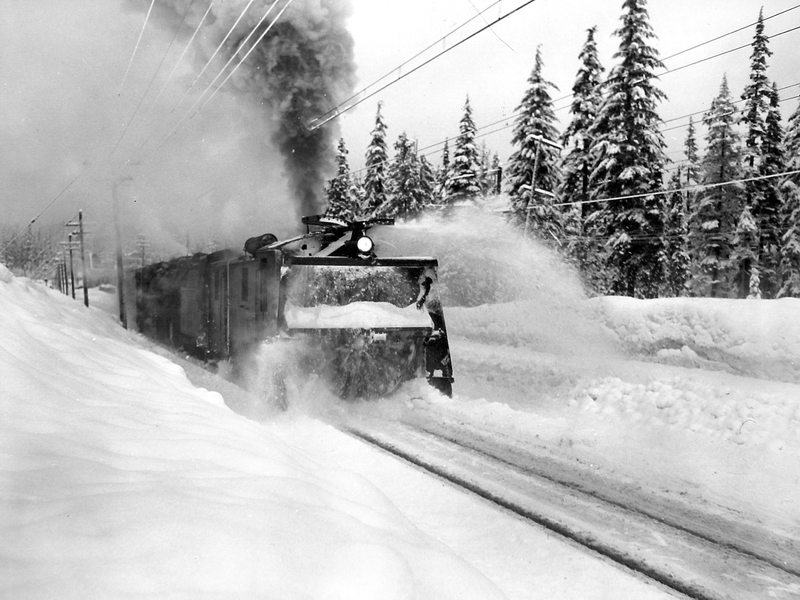 The Milwaukee Road played an important role in developing skiing in the Northwest. Seeing the success of Union Pacific’s Sun Valley, Idaho ski resort that opened in 1936, the railroad opened the Milwaukee Ski Bowl in 1938, at its Hyak stop on the east portal of its tunnel under Snoqualmie Pass. The Ski Bowl offered access by train from downtown Seattle in two hours, a modern lodge, the first J bar ski lift in the Northwest, and lighted slopes for night skiing, and dramatically changed local skiing. The Seattle Times offered free ski lessons at the Ski Bowl to high school students. The author’s mother, Margaret Odell, was advisor to the Queen Anne Ski Club from 1938 – 1941, and took her students by train to the Ski Bowl every weekend. A giant ski-jump was built at the Ski Bowl for the National Four-Way Championships held in March 1940. Downhill and slalom races were held on Mount Baker, the cross-country race on Snoqualmie Pass, and the jumping competition at the Ski Bowl. Torger Tokle, a Norwegian living in New York, had longer jumps than Alf Engen, but Engen won the jumping event on form points, as well as the overall Four-Way title. In 1941, Tokle set a North American jumping record at the National Jumping Championships at the Ski Bowl in front of 5,500 fans. World War II changed everything. Skiing stopped as men went off to war, and women had to deal with war-time living conditions which included rationing of items such as gasoline and tires. 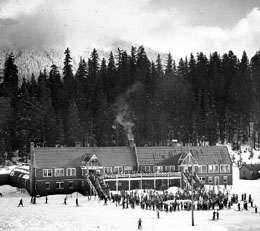 The U.S. Army’s Ski Troops trained at Mount Rainier from1940 to 1942, before moving to Camp Hale, Colorado in 1943. In December 1942, the Milwaukee Railroad shut down the Ski Bowl and committed its resources to the war effort. Skiing resumed after World War II, and ski areas reopened and expanded. The Ski Bowl resumed operations in the winter of 1947, with the Talley-Ho Ski Boggan, the first high-capacity ski lift on Snoqualmie Pass. It was a massive sled that carried 32 skiers at once, and could carry 1,440 skiers per hour. Free Seattle Times ski lessons were again offered for students, including jumping and racing instruction. In 1947, the Ski Bowl hosted tryouts for the jumping events of the 1948 Olympic Games at St. Moritz, Switzerland, and six jumpers were selected for the U.S. Olympic team. More than 50,000 skied at the Ski Bowl in 1947. For 1948, the Ski Bowl underwent “an extensive summer clearing and grading program,” and the National Jumping Championships were held there in March. On December 2, 1949, the Milwaukee Ski Bowl Lodge burned to the ground in a $180,000 fire. The railroad spent $25 – 30,000 the prior summer to make the area the “best all around ski center in the state.” The Ski Bowl operated during the winter of 1950, using train cars on a siding for shelter. However, the Milwaukee Road closed the area permanently in the spring, saying it could not justify the $125,000 it would take to rebuild. The Times cancelled its ski school, which had operated from 1938 – 1942, and from 1947 – 1949, teaching the fundamentals of “controlled skiing” to over 20,000 students The area remained unused until 1959, when the Hyak Ski Area was opened. The Milwaukee Road proved to be an unprofitable business venture, and has been called “a railroad that probably should not have been built.” It was never able to compete with the Great Northern and Northern Pacific. For years, the Milwaukee Road unsuccessfully sought mergers with other lines. In 1970, a merger of the “Hill Lines” was approved, integrating the Northern Pacific, Great Northern, the Burlington, and the Spokane, Portland and Seattle Railroads into the Burlington Northern line, which surrounded the Milwaukee Road. The Milwaukee Road filed for bankruptcy in 1977, ended service the same year, and its Pacific Extension was abandoned in 1980. Its right-of-way in Washington was acquired by the state and converted into the John Wayne Pioneer Trail in Iron Horse State Park, which is part of the National Heritage Trail system.